In this article the biographical information about professor A.F. Ukhin is represented, which reflects his scientific and practical contribution to the development of native dermatology and venerology in the period of his work on the chair of skin venereal diseases of the Saratov State Medical University. All articles of the authors: Orkin V.F. , Yakupov I.A., Zavialov A.I. Results of the complex clinical-electrophysiological research. Including EEG, trunkal acoustic (ATEP) and visual evoked potentials (VEP). Of 120 patients with tumors of the brain of various localization and histologic structure are presented. In all patients extrapyramidal symptoms were noted. The Parkinson’s syndrome has been revealed in 57 (47.5%) patients. Features of theclinic and pathogenesis of Parkinson;s syndrome in case of intrabrain tumors of basal ganglia and thalamus. According to EEG-data and the evohed potentials of a different modality alectrophysiological criteria of injury of subcortical structures in case of tumors of the brain are produccd. It is emphasized, that in patogenesis of Parkinson’s syndrome in case of tumor of the brain the deformation and displacement of subcortical-trund structures has essential value, especially mesencephalic sections of the brain stem. All articles of the authors: Poverennova I.E. This report presents an analysis of investigation of health related quality of life of 307 patients with cholelytias disae after the traditional laparotomic and laparoscopic cholecistectomy. During the in patient treatment in region Balakovo, Saratov. The research result allow to determine for sure the increasing life quality patients after surgery treatment on account of cholelityas disae. All articles of the authors: Orlov S.V. Social and psychological problems of complex rehabilitation of patients with synchronous malignant tumors are not solved yet and require the futher scientific work. The purpose of our investigation was the study of life quality of the ginen patients category, using the adapted questionnaire FAGT-G (The Functional Assessment of Cancer Therapy - General). The analysis of the data has shown that 30% of patients with synchronous polyneoplasia have problems in psychoemotional sphere. These data are confirmed by the scale of depression results and by peculiarities of the psychological reaction to diseases. That’s why the correction of psychoemotional condition is an important component in modern social technologies. The practical realization of social technologies of rehabilitation is the program of complex rehabilitation of patients. The construction of such program of complex rehabilitation of patients with synchronous malignant tumors will consider all possible ways of improvement of patint’s quality and adapt to the new conditions of vital activity. All articles of the authors: Bluvshtejn G.A. Research objective: to clear up the specific features in diagnostics and the reasons for introduced errors in diagnosing multiple primary synchronous malignant neoplasms with one of their localization in a mammary gland. Sources and methods: The present research is based on medical histories and questionnaires of 92 patients (1 group and control group) suffering from synchronous multiple neoplasms. Results: It was found out that at multiple primary processes the primary neoplasms (tumors) are usually located in a mammary gland (89.1 ± 3.2%); their presentation is asymptomatic on the one third of patients (31.9 ± 4.1%); those tumors are usually detected by the patients (68.5 ± 4.8%). The second and the following tumors are localized in a mammary gland (56.4 ± 5.2%) and a thyroid gland (26.1 ± 4.6%) in most cases. The presentation of a tumor is not usually clinically significant on the half of the patients (50.0 ± 5.2%); that is why a tumor is not usually detected on 23.9 ± 4.4% of the patients at medical examination. The reasons for overlooked tumors: 1) incomplete medical examination of patients (54.5 ± 5.2%); 2) low skill level of doctors responsible for medical examination (27.3 ± 4.7%); 3) difficulties at conducting clinicopathologic diagnostics (18.2 ± 2.8%). All articles of the authors: Popova T.N. In 102 patients with psoriasis in a progressive phase indexes BSA, PASI, DLQI were defined, as well as the content of molecules of average weight and immune cpmplexes in blood. It was determined, that in patients with psoriasis endotoxocosis is developing, shown during the laboratory examination as increase of biochemical not only with the form and prevalence of dermatosis, but also exerted adverse influence on the quality of life of the patients as a whole. 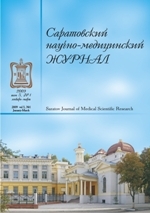 All articles of the authors: Bakulev A.L., Svistunov A.A. The analysis of the long-term results of 47 patients (54 hip joints) with the hip joint dysplasia is presented in this article. The course of disease was complicated by the multiplanar deformity of the proximal part of femur and early development of deforming coxarthrosis. The analysis allows to define the clinical and X-ray signs of the possible multiplanar deformity of the proximal part of femur in children with dysplasia of the hip joints. It also allows to diagnose the pathological shanges during the treatment ad at the age until 12 months. The worked out tactics of treatment for such patients allows to prevent the development of the early coxarthrosis. All articles of the authors: Vinikurov V.A.